PANO - The Vietnam Helicopter Corporation (Corps 18) of the Ministry of National Defence, has received a EC-130 T2 helicopter, made by Eurocopter Company. At the handover ceremony, Senior Colonel Nguyen Duc Hoa, the corporation’s Deputy Director General, congratulated the crew on successfully receiving and landing the helicopter, numbered VN 8632, in Vung Tau city, Ba Ria-Vung Tau province. EC-130 T2, a light single-engine helicopter, has a roomy cabin seating seven passengers, bringing comfort with low specific fuel consumption, for search and rescue activities, training, and air-taxi service. 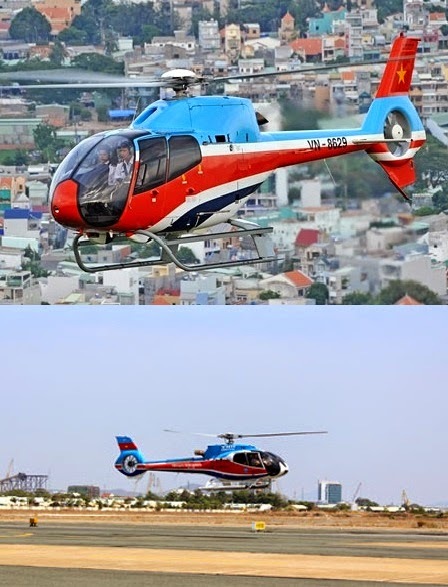 The purchase continued affirming and heightening the Vietnam Helicopter Corporation’s ability and position in doing business in combination with implementing military and defense tasks. The Vietnam Helicopter Corporation new EC-130 T2 light single-engine helicopter.